Working with pictorial ideas developed by Giovanni Bellini and extended by Giorgione, Titian unequivocally establishes his own stylistic personality in this early panel. 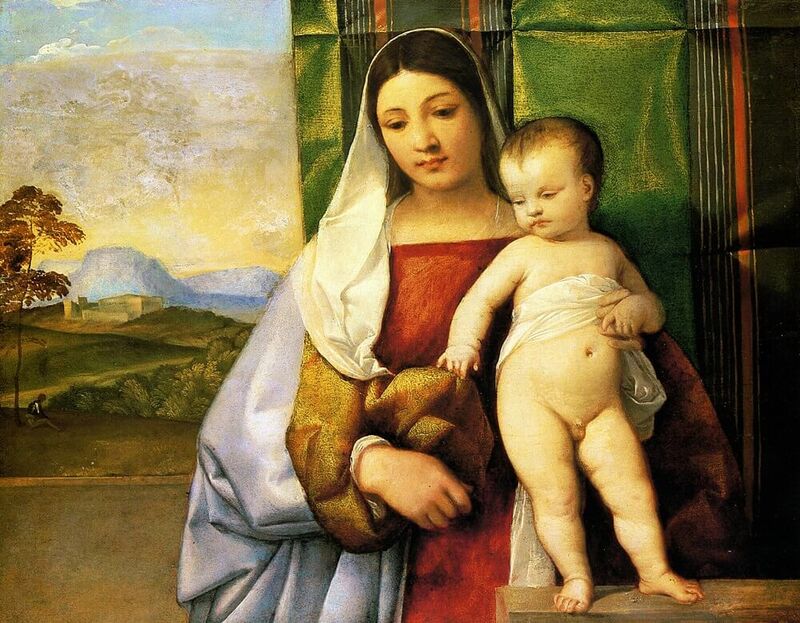 The motif of the half-length Madonna and Child seen behind a parapet and set against a rich cloth of honor had been a staple in the artistic production of Bellini and his shop; typically, however, the composition was more iconic and centralized, the cloth hanging directly behind the figures and revealing on both sides a landscape view. Titian's design, operating significantly within a dominantly horizontal format - more narrative and less iconic - shifts both cloth and parapet to one side, thereby creating an asymmetrical composition of more dynamic contrasts. The full, organic forms of the figures are plotted against the precise yet varied rectilinear gridwork of the pattern and folds of the cloth of honor, and further stabilized by the horizontal fragments of wall and parapet. The landscape, an idyllic scene in a Giorgionesque mode,with a lone armored figure beneath a tree, assumes a greater importance within the overall pictorial field, and the contrasts of distance and size assume significant roles in the functioning of the image. The broad stretch of landscape also performs an important spatial function: it is necessary to accommodate - visually, if not actually - the volume of the Madonna's impressive form. The pyramidal structure of her shape, quite clearly speaking a High Renaissance formal language not unlike that of Da Vinci's Madonnas, distinguishes Titian's conception from those of his Venetian predecessors, and this breadth of form allows a new gravity to both Virgin and Child. The small figure of Christ stand; firmly, in a contrapposto of classical confidence, and his face, thinly painted, reveals a knowing intelligence tha matches the composure of his mother. Titian's sense o weight, never a merely formal device, is from the very beginning of his development committed to the expressioi of dramatic or psychological values.